It's the hot new emerging market. But can President Peña Nieto and his team of reformers really turn their country around? Lea el artículo de portada de nuestra edición internacional sobre el trío que busca salvar a México. At 9 o'clock on a February night, Mexican President Enrique Peña Nieto was still working inside Los Pinos, his official Mexico City residence, where camouflaged soldiers with assault rifles stood guard outside. For the 47-year-old President, it was a reminder that the presidency is a deadly serious business--especially at this pivotal moment in Mexican history. Five years ago, drug violence was exploding, the Mexican economy was reeling, and a Pentagon report likened the Aztec nation to the terrorist-infested basket case Pakistan, saying both were at risk of "rapid and sudden collapse." As Barack Obama prepared to take office in 2008, one of his senior foreign policy advisers privately nominated Mexico the most underappreciated problem facing the new U.S. Administration. Now the alarms are being replaced with applause. After one year in office, Peña Nieto has passed the most ambitious package of social, political and economic reforms in memory. Global economic forces, too, have shifted in his country's direction. Throw in the opening of Mexico's oil reserves to foreign investment for the first time in 75 years, and smart money has begun to bet on peso power. "In the Wall Street investment community, I'd say that Mexico is by far the favorite nation just now," says Ruchir Sharma, head of emerging markets at Morgan Stanley. "It's gone from a country people had sort of given up on to becoming the favorite." Want proof? On Feb. 5, Mexico's government bonds earned an A-- rating for the first time in history when Moody's revised its assessment of the country's prospects, ranking it higher than Brazil, the onetime darling of international investors, and making it only the second Latin American nation after Chile to get an A. "I believe the conditions are very favorable for Mexico to grow," Peña Nieto told TIME in an interview at the Los Pinos compound. "I'm very optimistic." He'll share that optimism with Obama when the U.S. President arrives in Mexico for a North American leaders summit on Feb. 19. Obama will likely nod in approval: a booming Mexico--integrated with the U.S. economy in myriad ways--would put wind in the sails of U.S. economic growth and further reduce an already declining flow of immigrants illegally crossing the shared 1,933-mile (3,110 km) border. But "Mexico's moment," as many are calling it, could still disappoint. 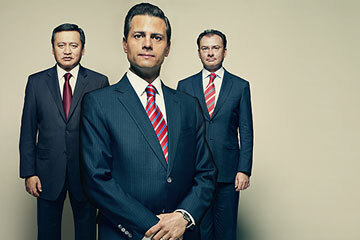 Corruption and mismanagement are endemic to Mexican politics. Some of Peña Nieto's reforms are engendering fierce resistance. And drug trafficking, with its related crime and violence, remains a defining fact. After his interview with TIME, Peña Nieto went straight into a meeting to plan his trip the next day to Michoacán, a nearby state where vigilante groups have formed to fight drug bosses who have seized control of their towns. Officials and experts in both Mexico and the U.S. describe a country at a pivot point. "This is dramatically different from what we've seen before," says Duncan Wood, director of the Mexico Institute at the Wilson Center. "I reserve judgment for the time being on whether this is all going to work out."